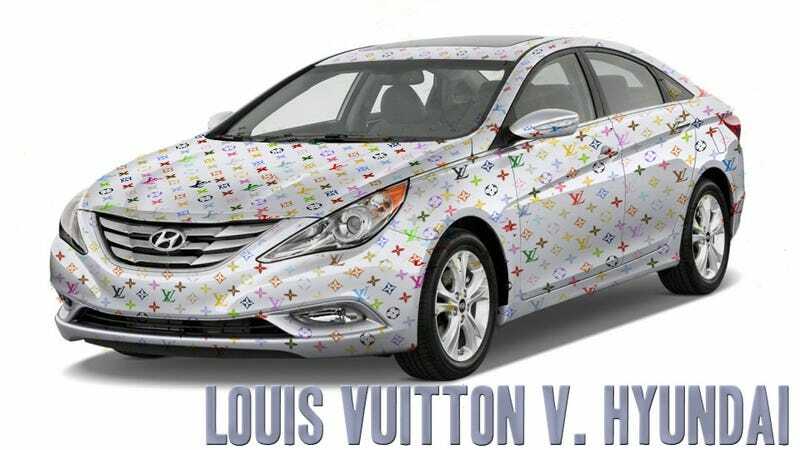 Remember Hyundai's Super Bowl ad featuring a guy playing with a Louis Vuitton-monogramed basketball? The fashion house didn't like it, taking the Korean automaker to court and winning in a verdict that looks to have far-reaching effects on free speech, as Andy Sellars from Harvard's Citizen Media Law Project explains below. — Ed. From the ever-growing file of trademark cases that are bad for free speech, Eric Goldman and Techdirt bring us an interesting case concerning a recent Hyundai ad. The ad is a series of brief vignettes conveying luxurious items in non-luxury settings: a yacht parked next to a small suburban ranch house, cops in a squad car snacking on caviar, chandeliers for streetlights, lobsters and roast pigs in what looks like an office breakroom, and – most importantly for our purposes – a group of people playing basketball with a ball that appears to have what Louis Vuitton calls its "Toile Monogram" pattern on it. Baroque music plays throughout, and a sonorous voice asks the audience, "What if we made luxury available to everyone? Would it still be called luxury? Or maybe we'd need a word for it. Oh, here's one: 'Hyundai.' The all new Hyundai Sonata." This story originally appeared on the Citizen Media Law Project Blog on April 12, 2012 and was republished with permission.